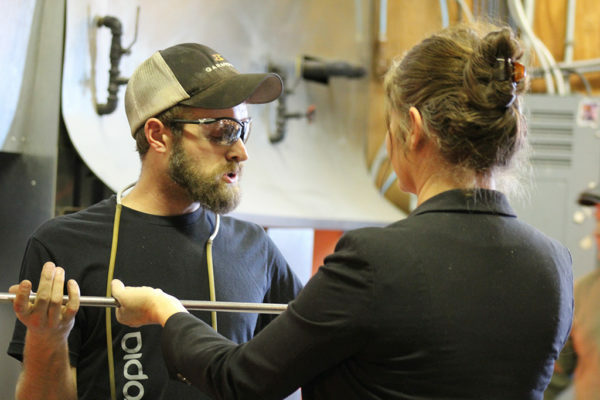 Vetro Glassblowing » Happy Father’s Day! Celebrate Father’s Day the Vetro Way! The fire that fuels a father’s passion burns deep within the depths of their hearts to see that their children can be all that they can be! No matter what boulder these special men have to move, to make this happen, we are reminded daily that our dads are our Superheroes. 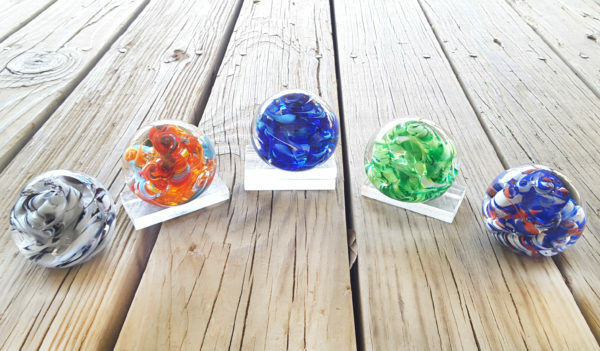 Join our team as we celebrate father’s day by sculpting glass paperweights. Children and adults of all ages may come and choose from our 5 pre-selected color mixes, and Help Create your Superheroes paperweight. Let us remind them again why they are our one and only Superheroes on this Father’s Day! Saturday, May 11, 2019 - 10:00 a.m. - 5:00 p.m.
Register online, pre-pay for your booked time slot. Come out to Vetro Glassblowing Studio 15 minutes prior to your reservation time to sign your waiver. You stay by the artist while he/she blows and shapes your Art Glass. Pick up your artwork the following business day after 3:00 p.m. The gallery is open Tuesday – Saturday 10 a.m. – 6 p.m. and closed Sunday and Monday or you may have it shipped for an additional fee. Pieces made on Saturday can be picked up after 3 p.m. the following Tuesday or any other day during Gallery hours; the glass pieces must cool for at least 24 hours. Due to the nature of glass, there is a possibility that your glass art piece could break or crack during the cooling process. If this happens, we have three different options: (1) You may choose out of the Help Create color mixes and your artwork will be created for you. (2) You can choose the same type of art glass piece form Vetro’s gallery; (3) You can schedule a time to come back to the Vetro’s Studio and re-make your art glass piece! Kids of all ages welcome to observe; under 18 must be accompanied by an adult. Should you need to cancel, we must be notified by 10 a.m. the day BEFORE your reservation. A Processing Fee of $10.00 will be deducted from each of your time slots for your refund. Should you need to reschedule a $5.00 processing fee will apply to each time slot. Time slots for creating glass are limited because of the space we have in the annealer. We want to make it fair to all our glass loving patrons. Please keep in mind that all notifications after 10 a.m. the day before your scheduled date are non-refundable and will not be rescheduled. Should you miss your appointment you may contact the gallery and let our studio staff knows the color you would like to choose out of the Help Create color mixes and your product item will be created for you. Celebrate dads and all their hard work with a special handcrafted gift they will cherish for a lifetime! Not all superheroes can be Glassblowers but every hero can appreciate handcrafted glass blown art. If you are looking for a fun functional glass father’s day gift we also have handcrafted beer glasses available for purchase.